This course is suitable for anyone involved in both manual and CNC trimming, finishing and assembly of composite parts, including technicians, supervisors, engineers, designers, researchers and managers. We are afraid to say that there is no 'Speeds and Feeds' tables for composite materials due to the wide material combinations available. We will show you how to select the right tools and cutting heads for the right job and how manual methods can provide insight on how CNC methods can be applied effectively. This course will give you comprehensive training, understanding and application of a full range of trimming, finishing and assembly techniques associated with composite parts. It is suitable for anyone involved in manual and CNC trimming, finishing and assembly of composite parts, including technicians, supervisors, engineers, designers, researchers and managers. There are no speeds or feeds tables for composites due to the range of material that can be in the part. The focus of this course is to select and use the right tools, abrasives, cutters and technique for the best results. With a methodical and ordered approach through the week, new skills, tools and processes are introduced, giving you the confidence to try new equipment. We will show you how best to plan composite trimming and assembly activities, covering composite theory, alongside approximately 28 hours of hands on practical. The course begins with interpreting technical information from engineering drawings. This information can then be applied to your assembly allowing you to plan and work systematically, from measuring and marking, to bonding the completed assembly together. You will mark a range of component features, for example concave and convex surfaces, radii, multiple drill holes and parallel lines using a range of equipment such as height gauge, surface table, scribes, calipers, rules and jigs. The final stage in the process is finishing, where you will be cleaning and polishing your components. 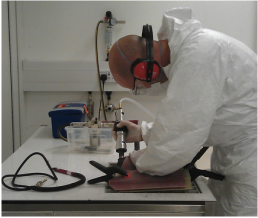 Working through a range of abrasives and cutting compounds you will learn how to best achieve the required finish. Cutting and trimming follows, with the introduction of air tools and how best to control dust generation, in line with good health and safety practices. Emphasis is placed on the safe and effective use of tools and abrasives. After demonstrations you will get to find which tool and abrasives work best. Under the guidance of our experienced tutors you will be working with different materials and features. You will use band saws, bench mounted disk and belt sanders and a range of air driven hand tools, including die grinders, cut off wheels, routers and belt linishers. These all come with their own range of silica carbide or diamond abrasives to try. Drilling, boring and countersinking are completed with diamond bits to get the best results. Laminate supports and high speed drills offer solutions for minimising break through and localised delamination.